Williams Lifts is happy to offer used stair lifts for sale — an ideal solution for acquiring a mobility device at the most affordable price. We offer gently used, high quality used stair lifts for sale because customer satisfaction is our highest priority. Our used stair lifts are acquired through a buy back program where we buy back stair lifts from our customers who no longer need them. When a customer finds themselves no longer in need of their stair lift, we’re happy to take if off their hands and offer it at a reduced price to another customer in need. Since we mostly buy back units that were purchased from us in the first place, we are confident in the quality of our used stair lifts for sale. That means we know the history of most of the used units we sell — where they’ve been, the extent to which they’ve been used, how well they have been maintained, and so on. If a stair lift does not meet our standards after going through a thorough inspection, we will not buy it back for resale to our customers. As one of the most well-known stairlift companies in New Jersey, we can offer used stair lifts for sale at very affordable prices thanks to this buy-back program. Our selection of used stair lifts for sale varies. It all depends on what we have available at the time, but we always carry the Bruno and Acorn brands of stair lifts. We offer used stair lifts for straight rails. Bruno and Acorn are the market leaders in residential stair lifts, so we trust you’ll be satisfied with their unmatched levels of comfort and reliability. To assess the quality for yourself, or to see what we have in stock, we invite you to come in and visit our showroom at any time. If we don’t have the exact model you’re looking for in our selection of used stair lifts for sale, there is always another option available to you. If you’re on a strict monthly budget, we also offer stair lift rentals. 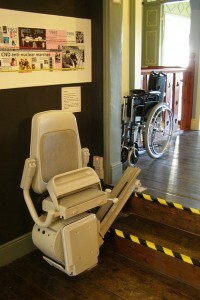 For a low monthly payment you can have a stair lift in your home to satisfy your mobility needs. In addition, you can apply 50% of your rental payments towards purchasing the stair lift if that’s what you decide to do down the road. When you acquire a stair lift from us, we take care of the delivery and installation so you don’t have to worry about anything. Our technicians are trained to install a stair lift within a few hours without damage to your existing stairway or handrails. If you’d like to learn more about used stair lifts for sale in New Jersey, please call us today for free estimate or brochure at 908-322-7070.